EL NIDO - CORON FERRIES. Book and pay online, relax all the way. We only work with qualified and high standard boat operators. Malcapuya Island - An hour away from Coron town, this island is the ultimate virgin beach, with white sands, clear water and abundance of corals and various kinds of marine life. Take a boat tour and relax for a day around the island. Water sports - Learn kitesurfing in the 250k kite camp. It is located on a private island, right on the way between El Nido and Coron. 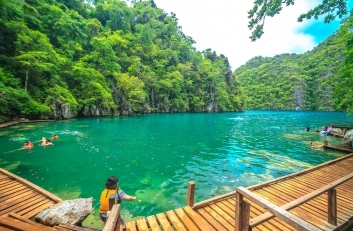 Amazing Lakes - Coron is filled with lakes and lagoons of crystal-clear waters, nested into mountain walls. Visit Kayangan Lake, Barracuda Lake, the Twin Lagoons and more for an unforgettable combination of water, underwater and sky views. Q: How long does the sail take? A: 4-6 hours depending on sea conditions on the regular ferry. Q: Where does the ferry depart from? A: From the ferry terminal in El Nido (at the west point of the beach), and from the Coron port in Coron. Q: How many places are in a ferry? A: Ferry capacity ranges from 36 to 80 seats, depending on season and volume. Q: Who operates this site? A: The site is managed by bookaway.com. Q: Who operates the ferry? 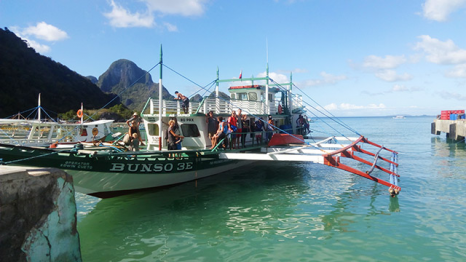 A: The ferries are operated by Bunso boats, and approved by the local coast guard. 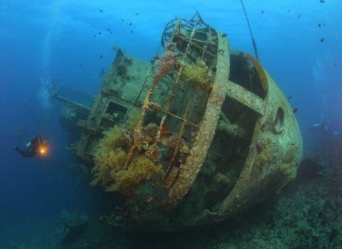 Q: What kind of a boat is it? A: The ferry is a large Filipino style outrigger boat, with a closed passenger compartment, and a narrow side deck. Passengers sit on benches along the compartment. A: Yes. as long as you notify us at least 72H in advance. Cancellation is possible up to 72 hours in advance, with a 15% cancellation fee. Q: How can I contact you if I need a change? A: You can contact us either by emailing tickets@coronferry.com, or by online chat. Coron Ferry is part of Filipino Routes, an online travel brand which is dedicated to bridging the online gap for local tourist suppliers.